Today's recipe is a must in any Damascene restaurant meal. It is an essential part of any meal you almost get served these by default, sometimes without even ordering them. To start your meal you will get served one of these and one Kibbeh Me'lyieh (Fried Kibbeh) along with the usual suspects of hummus, mutabal and fatoush. For this recipe I used my mum super fast borak dough recipe. This dough recipe is only good to be fried as it will come out crisp and flaky. If you want oven baked borak you will be better of using puff pastry but you need to roll it really thin so you don't end up with cheese puffs. I made my borak in the traditional rectangular shape. Not the most aesthetic but diffidently the most traditional. Start by preparing the filling. Crumble your white cheese and mix with the rest of the ingredients. You can use any type of Arabic white cheese. I usually use Nabulsi cheese. It has a great subtle flavour. If you don't have access to Arabic white cheese then you can try my alternative mix of Feta and Mozzarella. Roll the dough very thinly and cut into rectangles. Spoon some of the cheese mix, fold the dough and press the edges to seal it. You can use a pizza or a ravioli cutter to make the edges pretty (unlike mine!). Deep fry in vegetable oil, drain on a kitchen towel and serve warm. I'm reading many deep fried recipes today on the blogsphere and I guess how much ever I hate deep frying, this one's got on my list. I have all the ingredients on hand, so lets see. I hope you like this recipe when you try it. 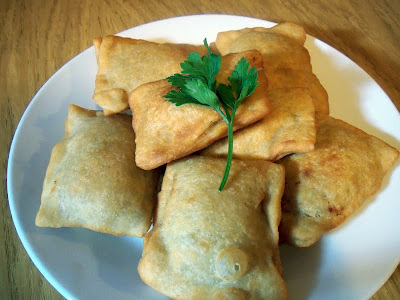 i love borek, and this recipe is great, and so is the photo, ieally looks delicious, cheers! Can I marry you? This is rediculous. I love your blog. Thank you. I hope you get to try it and anjoy it. On a serious note, welcome to my blog. I am really glad you like it. I cant wait to try your mom's borak recipe! Let me know how it works if you got to try it. This dish looks absolutely delicious! I wish that I had a big plate of these fried treats in front of me right now. Yum!!! Borek may make me happier than pretty much any food other than makdous. Thanks for posting this! You welcome. Hope you get a chance to try it. Ive always wanted how to do these ,even though mums turkish and always eat it at turkey but didnt find it until i saw ur site. How deep into the heart of Essex are you? I've recently moved there too and I'm on the look out for Middle Eastern shops or shops selling ME ingredients. Any recommendations? Not that deep, I guess. I am living in Brentwood. Quite a nice area. No Middle Eastern shops around here I know of. I still stock on stuff everytime I am in Shephereds Bush or Edgware Road. It is a great easy pastry! You don't go wrong with this one. HI! I stumbled onto your blog trying to find the name of the cheese puff I had from my recent holiday in Syria. I am soooo going to try this as I have all ingredients..except maybe Arabic cheese. Hafta use feta and moz mix. U didn't say roughly how many pieces it makes. Please try these and let me know how it goes. This recipe will make 15 - 20 borak. I am very glad you tried them. I know it hasen't been the roaring success you were hoping for but it is your first dough ever. I think you needed to roll them a lot thinner. Thank you so much for sharing your recipes! I am Korean and my husband is American...we were recently invited for dinner by my Syrian friend. His gracious mother made several dishes that I fell in love with! His poor mother had hardly any time to eat as I was asking her so many questions about her dishes. There was one that seemed similar to fried kibbeh, except it had a hard boiled egg in the center. Do you know what this was? Also, she served this fried bread, in the shape of fried kibbeh, with mozzarella and parsley in the inside. Unlike your borak recipe, she used yeast, but it seems that it might have been comparable to yours. Again, do you know what this was? I have been searching all over the net for syrian recipes and am so grateful I found yours. Please do not stop sharing! Sorry for the late reply. I missed your comment for some reason! I never tried or even heard of egg-filled kibbeh. It is definitely not a dish from Damascus. Regarding the other dish, it is cheese borak. There are so many variations of the dough recipe. Even in Syria cheese borak varies a lot from restaurant to restaurant. I hope this is helpful and please keep coming back for more recipes. does any1 know were can i get jebneh nabulssia in london ? Nabulssia cheese is widely available in London. Any large Middle Eastern supermarket will stock it. Try Green Valley on Edgware Road or Damas Gate in Sheperds Bush.